If you're a fan of cursed idols, ghosts, poltergeists, voodoo, and everything spooky, settle in because we have a treat for you. 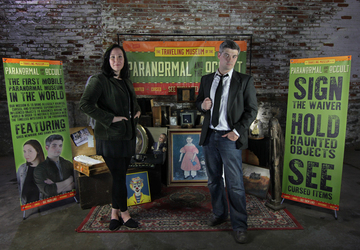 We recently visited the home of Dana and Greg Newkirk, professional paranormal investigators and curators of the wildly popular Traveling Museum of the Paranormal and the Occult. 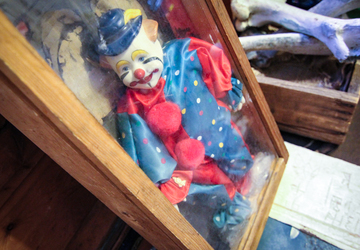 The museum is comprised of rare, haunted artifacts that travel the United States with the Newkirks. The couple attends conventions to showcase what's in their museum, often picking up new things along the way. When they're not traveling, though, they reside in a second-floor apartment in Covington. 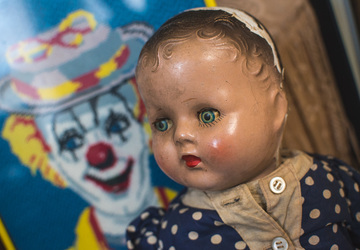 Believed to be over 80 years old, a baby doll named Ruby once belonged to a family who suspected it was the source of their children’s chronic illnesses. 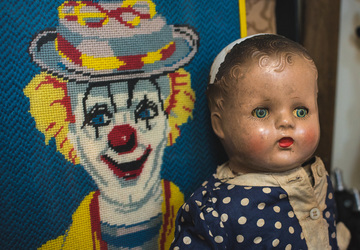 The original owner of the doll passed away from tuberculosis, and the family believed her spirit attached to the doll after her death. 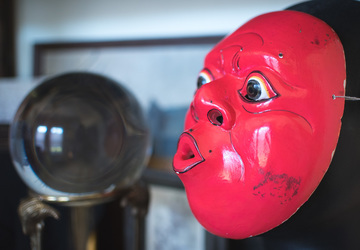 Ruby was given to Dana and Greg long ago before they even started their museum. They describe her energy as positive, despite her reputation of causing illness in her previous owner’s family. 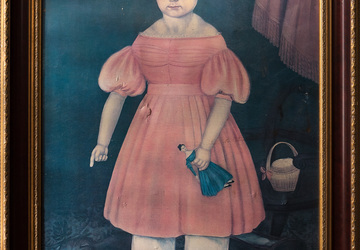 #9 - "THE RESTLESS PAINTING"
This framed portrait depicts a young girl holding a doll and pointing to a cat by her side. 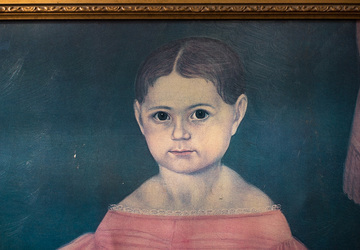 According to the painting’s previous owner, pictures hung around it would mysteriously fall off the wall when no one was looking. Occasionally it would leave the other pictures alone and instead remove itself from the wall. The peculiar thing about it is it’s not even a painting; it’s merely a print of one. According to Dana and Greg, this illustrates how paranormal attachment can happen to anything physical, not just old, valuable items. 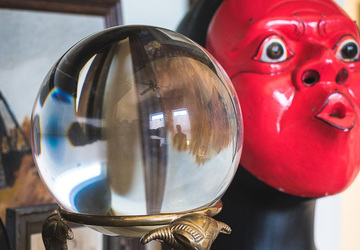 #8 - "THE GAZING GLASS"
A crystal ball perched atop an ornate metal pedestal that stands roughly a foot high, this artifact once belonged to a woman who was a tarot card reader in the 1970s. She eventually joined the Christian faith and placed the crystal ball and her cards in storage in her home. Assuming she’d already gotten rid of it, her family was surprised when they rediscovered the ball after her passing a year and a half ago. Her son took it home with him. However, every time he would stare into it, doors would slam and lights would flicker. It unnerved him. He believed his mother was attempting to stop him from using it from beyond the grave. He subsequently donated it to the museum. 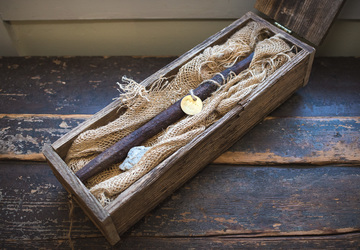 #7 - "GHOST MINE DRILL"
The Ghost Mine Drill is a coarse, iron pike roughly a foot and a half in length. It was unearthed in Crescent Mine in Oregon, which has been described as one of the world’s most haunted places as well as a (pardon the pun) goldmine for paranormal researchers. #6 - "THE CRACKING MAN"
One night, she awoke to a man standing by her bed. As she recoiled in shock and fear, so too did the unknown man. She described his arms as twisted unnaturally, and as he drew back, she heard the familiar popping noise echoing through his body. It was as if his bones and ligaments were causing the noise. Afterward, she promptly gave the doll, which she believed manifested the man by her bed, to the museum. Dana and Greg do not keep the Cracking Man in their own home because they, too, hear the popping. 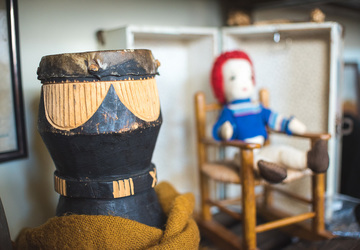 #5 - "THE CONJURING DRUM"
While not inherently spooky-looking, this modest wooden drum with a stretched, yellowed skin once belonged to a prolific voodoo family in Detroit. 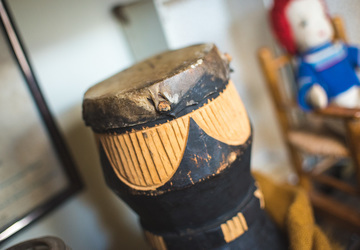 The drum is said to be a way to conjure loa (spirits) to help get things done in the summoner’s own life. When they used the drum, however, the family summoned a loa that made them uncomfortable; it would help them, but at the expense of others. They tried getting rid of it but had no luck in doing so. The name they gave the loa was Criminal the Arm-Twister. When it was given to the museum, Dana and Greg were told to never play it for fear of summoning Criminal again. To this day, they’ve never played it. #4 - "THE FETID FACE"
When Dana and Greg opened the package, they discovered the mask covered in human waste. After a comprehensive cleaning, a friend wore it for nearly a half hour while they observed his behavior. After he removed the mask, he described the sensation of leaving his own body. He then promptly got sick. 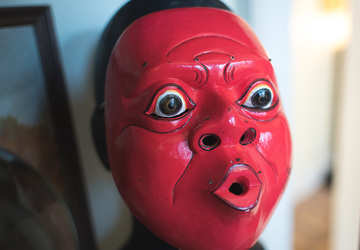 When others wore the mask, they described feeling intensely jealous of others upon removing it. 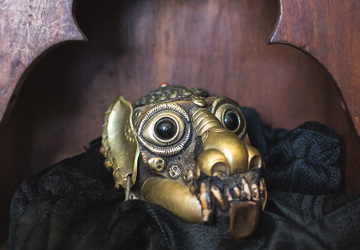 While its origin is unknown, Dana and Greg believe it could be an Indonesian mask based on the nails that remain around the eyes and mouth that may have once fastened a mustache and eyebrows to it. 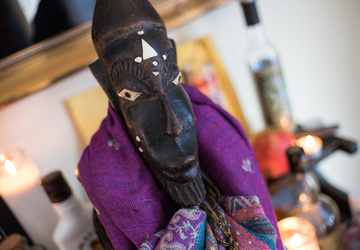 "Billy" is believed to be a 200-year-old Nkisi statue from the Congo. This dark brown, 3-foot tall wooden idol with (possibly) ivory accents likely belonged to a healer or shaman when it was created. At some point, it made it to the United States where it was discovered several years ago, wrapped in a burlap sack in a crawl space of a home in Dayton, OH. 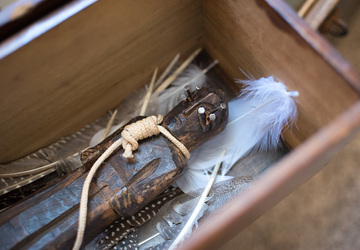 The owner of the home began having violent nightmares after finding the idol and eventually persuaded Dana and Greg to take it. After taking it, Greg also had haunting dreams. 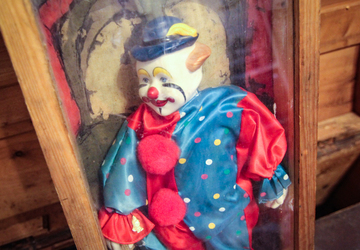 When they did EVP recordings to learn more about the idol, their equipment malfunctioned. After subsequent unsuccessful attempts, they finally managed to record the idol’s voice, which came through as a guttural, pained scream. 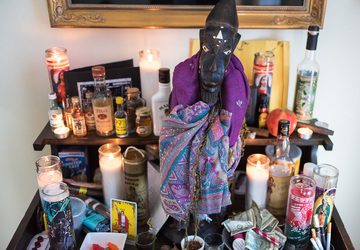 Since that initial recording, they learned the idol seeks offerings in the form of food, alcohol, tobacco, art, and other miscellaneous items, and they've been successful in re-recording his voice. Today, he serves as the museum’s de facto mascot. 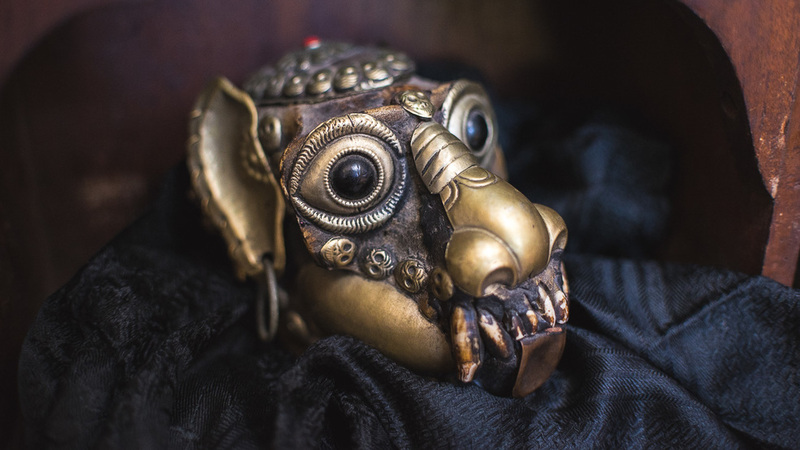 #2 - "THE BEGGING BOWL"
A man brought this Tibetan kapala (ornate skull used in ritual) to the U.S. in the 1950s. He said he had to “feed” the skull wine to avoid feeling uneasy and tormented by it. 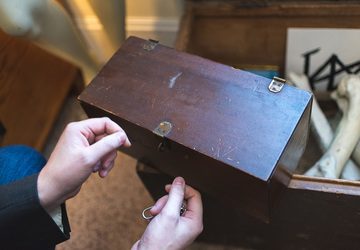 The man kept it inside a lockable wooden box that featured a knife drawer beneath it. 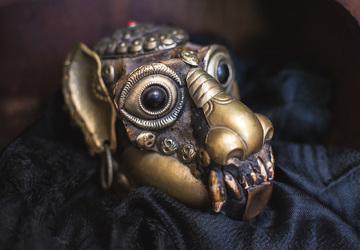 It’s a monkey’s skull outfitted with decorative metals. While its age is unknown, its recent past is clearer; after the man’s passing, his grandson inherited it. The knife went missing at some point, and the grandson said he hadn’t been “feeding” it as his grandfather had. Because of this, the grandson described the aura around the skull as “heavy, electric air” and soon began experiencing poltergeist activity in his own home. It made him supremely uneasy, so he gave it to the museum to be rid of the burden placed upon him. 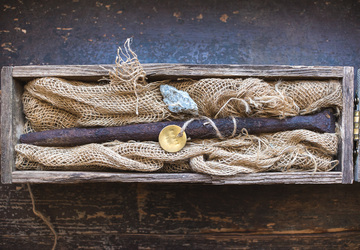 Two hikers in the Catskills discovered this artifact in a cave. 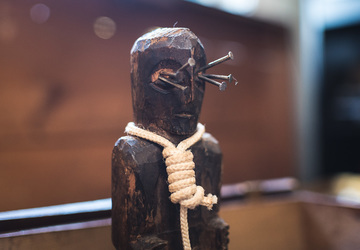 Its dark wood is roughly hewn into the shape of a person bearing three nails in each of its eyes and a tiny noose looped around its neck. After the hikers took it home, strong poltergeist activity began. 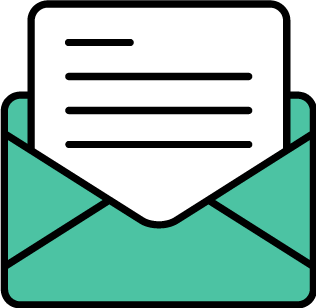 Their possessions were moved around, sinks randomly turned on, and more. The stench of stagnant pond water filled their apartment, and they noticed unexplained wet footprints all around the house. The two finally decided to get rid of it when they came home one evening to find the full-bodied apparition of a drenched, naked old woman standing in their living room staring back at them. They immediately left their home and got rid of the artifact shortly after that. Dana and Greg keep the Crone locked away now. They don’t show it anymore at the museum and plan to return it to the Catskills, believing that is what the artifact desires. As their most haunted object, they fear what it’s capable of and don’t want it potentially hurting anyone else. Sufficiently spooked? Don't worry. It's about to get worse. Head to the gallery above to see photos of all of the artifacts mentioned in this write up. 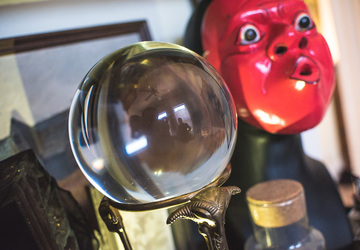 And check out The Traveling Museum of the Paranormal and the Occult online.